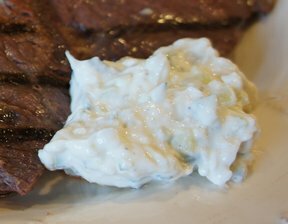 Commonly referred to as Greek garlic sauce, tzatziki is a refreshing condiment often added to gyros; it can also be served as a dip, a sandwich spread, or as an accompaniment for grilled lamb kabobs. Peel and remove seeds from 1 large or 2 small cucumbers and then grate them. 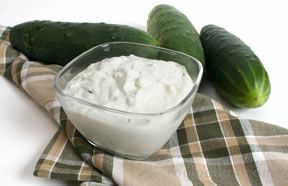 Place cucumbers on several layers of paper toweling. 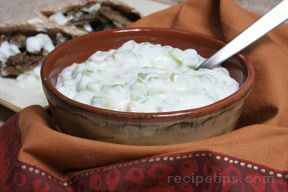 Sprinkle 1/8 teaspoon of salt on the grated cucumbers and let them stand for 30 minutes. 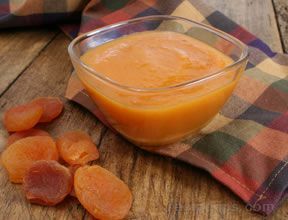 Place all ingredients in a bowl and stir the contents together until well blended as a sauce.